These are pretty much always called Scuds. Scuds can be an extremely important trout food source. They are often the most abundant aquatic macroinvertebrate in their habitat. They are crustaceans so they don't go through the same life-cycle complications as aquatic insects. They start out as small scuds, grow to be big scuds, and die. 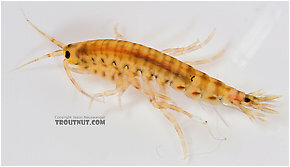 The most significant family to anglers is Gammaridae with the species of the Gammarus genus heading up the list. The smaller Hyalella species of the Talitridae can also be important. Though they all share the same silhouette, they can come in a surprising variety of sizes and colors. They run from size 8 to as small as you wish to imitate. The most common colors are olive or tan, though they can be found with yellow or gray base colors as well. Shading is often illusive to describe with highlights of pink, orange, green and even blue at times. It pays for anglers to notice both size and color differences in the waters they fish.